Sandy Point Shoal lies just north of Annapolis. The shoal extends nearly a mile into the bay. The first Sandy Point Lighthouse was a constructed 1858 on two acres of land on the western shore of the Chesapeake Bay, near where today’s suspension bridge meets the shore. Congress first appropriated $8,000 for the lighthouse in 1854, and the resulting keeper’s quarters with an integral tower and lantern were finished in 1858. W. J. Humes built the original structure, which boasted four rooms, a cellar and an attached kitchen. The brick quarters measured 31.5 by 18.5 feet, and the lantern tower with its flashing white light was painted red. In 1863, a fog bell was added to work in concert with the lighthouse’s fifth-order Fresnel lens. Before long, this setup was deemed completely inadequate to service the increasingly heavy volume of passenger steamers destined for the port of Baltimore. By the mid-1870s the treacherous shoals extended nearly a mile into the bay, and the tiny light and distant fog bell were of no use to “vessels drawing more than ten feet of water.” According to an 1874 Lighthouse Board report, the fog bell “could seldom be heard,” and “the defects of its location (were) especially felt during stormy weather in winter.” The Board recommended that a screwpile lighthouse be established at the edge of the shoal, and requested $40,000 for its construction. The request was repeated annually until Congress finally allocated $25,000 in 1882. The Board insisted that the exposed location of the shoal and the fields of moving ice called for the full $40,000, but that amount was denied. Consequently, the Board decided to use a caisson foundation and a more cost-effective brick tower, rather than the cast-iron structure they had originally intended to build. Construction was begun using these modified plans in August of 1883, and remarkably the lighthouse was finished by October of that same year. A Board report offers a matter-of-fact description of the efficiency and speed with which Sandy Point was erected. In August the workmen and material arrived at the site, and piles for a work platform were driven into the shoal’s bottom. By mid-August a derrick mast, concrete mixer, engine, boiler and boom were also in place. In late August the various sections of the caisson were already being assembled; these were “sunk into the sand 3 feet and leveled by means of a water-jet and force pump.” During the month of September, 1,000 cubic yards of concrete were mixed and deposited into the caisson, weighing it down firmly into the sand. By the end of September, all was ready for the construction of the brick lighthouse, and on October 10 the tower was topped by the lantern. 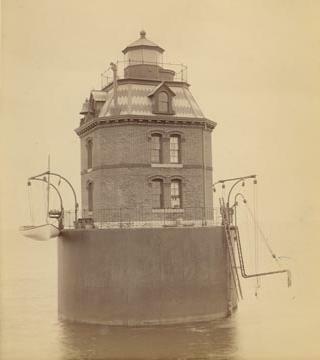 Though ready for exhibition on October 18, the light was not shown until October 30, 1883, pending publication of an official notice to mariners. The Sandy Point lighthouse possesses a three story timber-framed and masonry dwelling, measuring 24 feet square. The structure has its corners truncated, which gives it an octagonal appearance. A mansard roof, interrupted by peaked dormer windows on each of its four sides, tops the dwelling. Combined with the two adjacent windows on the north and south sides of the first two floors, the dormer windows lend a Victorian elegance to the lighthouse. This effect is accentuated by ornamental exterior brickwork, as well as a bracketed wooden cornice between the first and second levels. The tower’s cellar level consists of an octagonal room 16 feet wide, set within the actual concrete of the caisson. This room, accessed from the first floor via a wooden ship’s ladder, was used to store coal, water and oil. In the center of the room stands a masonry column, which supports a hollow iron column that lends structural integrity to the dwelling. At one time, the column housed the counter-weights for the fog bell striking mechanism. The first floor contains a 7 by 11 foot kitchen with a pantry, as well as a living room with a fireplace in the corner. The living room measures 9 by 19 feet, and would be used in the lighthouse’s later years as a radio equipment room. Three bedrooms are located on the second floor. Continuing up the spiral staircase, one ascends to the third or watch room level, which is split into two rooms. The walls on this level are wood framed with beaded wood paneling. The fog bell was originally hung from the east dormer on this level, but it has been removed. Moving up to the lantern room, the staircase switches from counter-clockwise to clockwise. This room’s original glass panes were set in cast-iron frames, above which rests a copper, standing seam roof lined on the inside with sheet metal. On the top of the roof there sits a ventilator ball. A half door made of plywood grants access via the parapet wall to the lantern gallery, which includes an iron balustrade. Two solar panels were ultimately bolted to the top rail of the gallery to power the light – a modern beacon that replaced the original Henry LePaute fourth-order Fresnel lens. 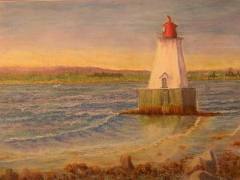 Sandy Point Shoal lighthouse was repaired and upgraded numerous times, before it was automated in 1963. The first of the changes consisted of switching the flashing light for one of a fixed characteristic in 1890. During this same year, the boat hoisters were fixed and the exterior of the tower was given several coats of paint to help combat the corrosive wind and sea-salt. A bit of an emergency occurred in 1901, when a routine inspection discovered a dangerous scour beneath the foot of the caisson. The McClenahan Granite Company out of Port Deposit, Maryland was contracted to put down 670 cubic yards of riprap stone in order to secure the foundation. Technological alterations to the lighthouse included a change from an oil wick lighting system to incandescent oil-vapor in 1913. This, in turn, was superseded by electricity in 1929, during which time the light characteristic was changed back to a flashing one. In 1938, the fog signal was described as a “third-class reed horn with a 12 foot copper trumpet.” After automation, a modern fog signal sounded every thirty seconds from mid September to the 1st of June. While automation did reduce costs, the unmanned Sandy Point Lighthouse was an easy target for the senseless acts of individuals. In mid-June of 1979, waterborne vandals broke off the exterior lock, climbed the tower, destroyed all the window panes in the lantern save one, and shattered the priceless 19th century crystal lens. Frustrated by the desecration of structures with tremendous navigational and historical importance, the Coast Guard called the vandalism a "dangerous, costly and senseless act" that endangers "the lives and property of mariners who depend on these aids" and offered a reward for finding the culprits. No one was ever apprehended or prosecuted, however. Between 1988 and 1990 the Coast Guard made a number of repairs, including substituting the deteriorating tin cornices with historically accurate mahogany replacements. This was achieved by removing a section of the old cornices and using it to make patterns at a Coast Guard Yard. Despite these efforts, there was plenty of other work that needed to be done. The gallery deck was badly cracked and threatened to admit water between the iron and concrete portions of the caisson. Injuries to the brick tower included crumbling bricks and mortar in need of point work, as well as missing window trim. Water damage to the interior had ruined most of the woodwork and plaster. In 1995 some of these concerns were addressed when a new copper roof was added, the gallery deck, rails and landing ladder were repaired or replaced, and the lighthouse was thoroughly repainted. In 2006, the work of maintaining the lighthouse was placed into the hands of private ownership via an auction held by the government’s Real Property Disposal Division. After no non-profit groups expressed interested in the lighthouse when it was offered under the National Historic Lighthouse Preservation Act in 2005, it was auctioned of on the internet where the winning bid, submitted on June 28, was $250,000. 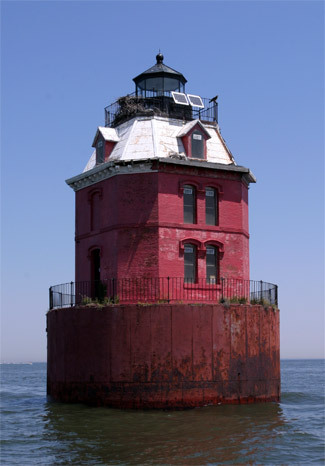 The private owner of the Sandy Point Lighthouse is required to allow Coast Guard access to the structure for periodical maintenance of the light. Only time will tell if auctioning off the offshore lighthouses on the Chesapeake Bay will be successful in preserving these beacons.